Spinal cord stimulation is a minimally invasive procedure that is used to treat chronic pain with a so-called spinal cord stimulator system, also called neurostimulator or neuromodulator. A spinal cord stimulation system is a technical device that is implanted under the skin. It sends electric impulses to the spinal cord. This way it can help to ease or end pain that is chronic and resistant to any therapy. The electric impulses change the way of pain transmission without harming any nerve. Spinal cord stimulation is also often called a pace maker for the nervous system.Nervensystem nennen. 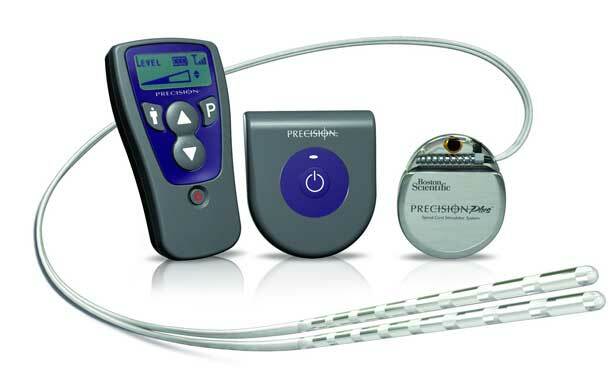 The implantation of a spinal cord stimulator is useful and medically indicated in case chronic pain. At first, chronic pain is treated by drug-related pain therapy, which may not have the desired but also side effects. Aim of the spinal cord stimulation is to sustainably ease the painso that patients can return to an almost painless daily life. Especially patients suffering from back or leg pain resistant to any therapy, or patients who have already undergone multiple spine surgery, can greatly benefit from spinal cord stimulation and enhance their quality of life significantly. This has been proven by several studies. But also patients suffering from peripheral vascular disease (PVD) or the complex regional pain syndrome (CRPS), experience a provable relief. The specialist associations do also recommend SCS in this cases.